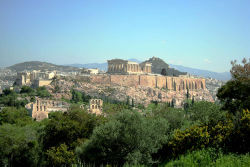 Athens is the largest and capital city of Greece, located in the Attica periphery, and one of the oldest cities in the world, with a recorded history of at least 3,000 years. Today, the Greek capital is Europe's 8th largest conurbation, a bustling and cosmopolitan metropolis with an urban population of 3.3 million and a metropolitan population of about 3.8 million people. The Athens metropolitan area is the centre of economic, financial, industrial, political and cultural life in Greece. The city is also rapidly becoming a leading business centre in the European Union. The city proper has a land area of 39 km², while the urban agglomeration of Athens spans 412 km². Ancient Athens was a powerful city-state. A center for the arts, learning and philosophy, home of Plato's Academy and Aristotle's Lyceum, Athens was also the birthplace of Socrates, Pericles, Sophocles and its many other prominent philosophers, writers and politicians of the ancient world. It is widely referred to as the cradle of Western Civilization and the birthplace of democracy, largely due to the impact of its cultural and political achievements during the 5th and 4th centuries BC on the rest of the then known european continent. The heritage of the classical era is still evident in the city, portrayed through a number of ancient monuments and artworks; the most famous of all the Parthenon on the Acropolis, standing as an epic landmark of western civilization. The city also retains a vast variety of Roman and Byzantine monuments, as well as a small number of remaining Ottoman monuments projecting the city's long history across the centuries. Landmarks of the modern era are also present, dating back to 1830 (and the establishment of the independent Greek state), and taking in the Greek Parliament (19th century) and the Athens Trilogy (Library, University, and Academy). Athens was the host city of the first modern-day Olympic Games in 1896, and 108 years later it welcomed home the Summer Olympics, with great success. A travel guide to Athens, capital city of Greece. Lots of photos, some videos, a webcam, great collection of hotels with online reservation option and various sections about Athens history and sight seeing. An excellent guide to Athens by Matt Barrett including sections like basic Athens info, walking in Athens, travel agents, getting out of Athens, photo tours and articles.